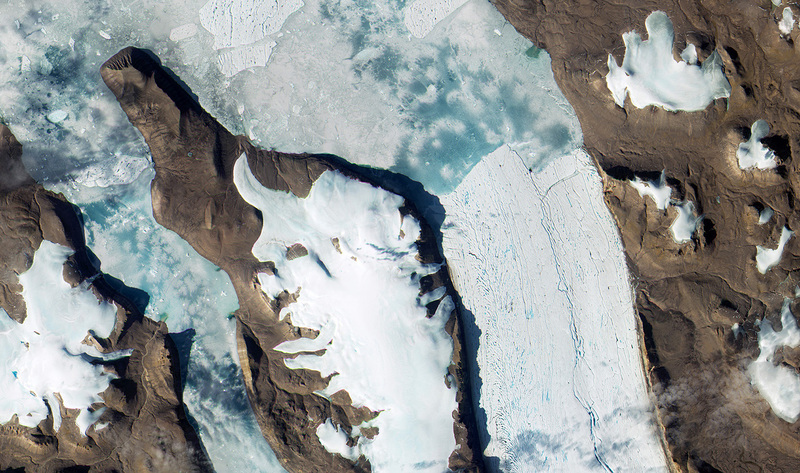 Last month, (July 2015) Europe’s Copernicus programme released this fascinating image of a glacier in Greenland. Environmental information helps us understand how our planet is changing and the role man-kind has to play in this. The Copernicus programme uses the Sentinel Earth observation satellites to give up-to-date information on the planet we live on. 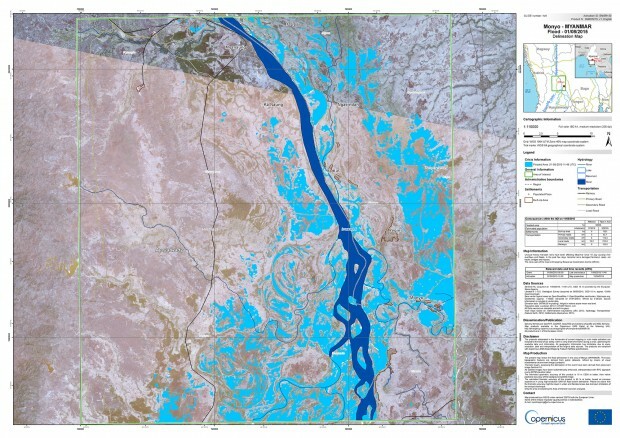 Satellite imagery is an important tool in the observation of the Earth’s environment as they can be used for monitoring remote environments. Earth Observation satellites can provide 24 hour data with high-resolution optical imagery. The Sentinel fleet are designed specifically to provide a wealth of data and imagery to the Copernicus programme. Sentinel-2A is specifically used to monitor plant growth, map changes in land and monitor the world’s forests. Glaciers are very common in Greenland due to the gigantic ice sheet that covers most of the country. The majority of glaciers in Greenland are slow-flowing rivers of ice that emerge from the ice sheet. Copernicus data is also crucial in natural disasters. 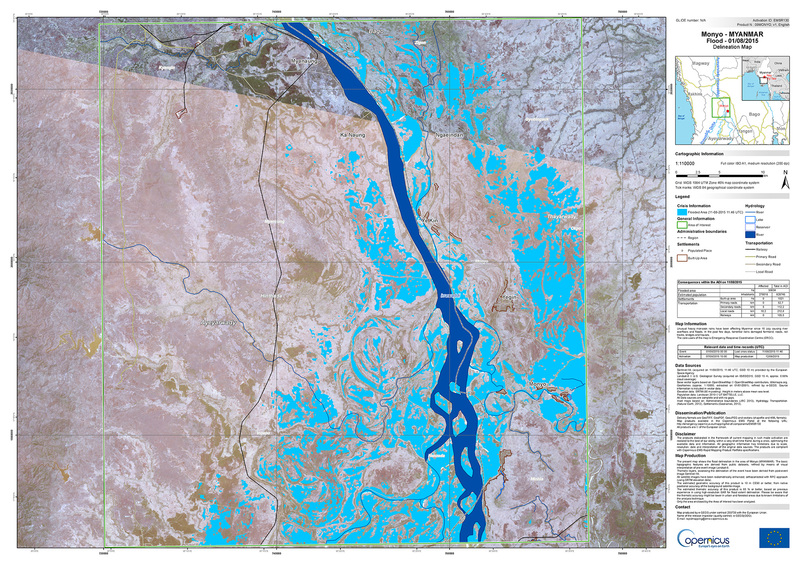 Thanks to radar scans from Sentinel-1A, the Copernicus Emergency Management Service (EMS) managed to get a clearer picture of the floods in Myanmar, allowing aid to find those in need. Nearly one million people have been affected by the flooding across Myanmar since June and officials declare that up to 100 people have died due to some of the worst flooding in decades. The country normally expects flooding during the monsoon season, however this year the floods have been made worse by Cyclone Komen which caused extensive damage to the less-prepared Rakhine state. Rakhine has witnessed the most deaths in the 12 states affected. It is reported that 17 million people live in the most affected areas and over 600,000 acres of land has been damaged. Myanmar farmers are at the critical phase of the cropping calendar, where rice must be planted within the next couple of weeks in order to make the next harvest. Many of the people rely on these crops for food. Click here to find out more about Copernicus data and make sure to follow us on Instagram, Facebook and Twitter. A word from our Space Economist.